You are here: Home / FREEbies / FREE Holiday Bucket List! Looking for some fun things to do leading up to Christmas? 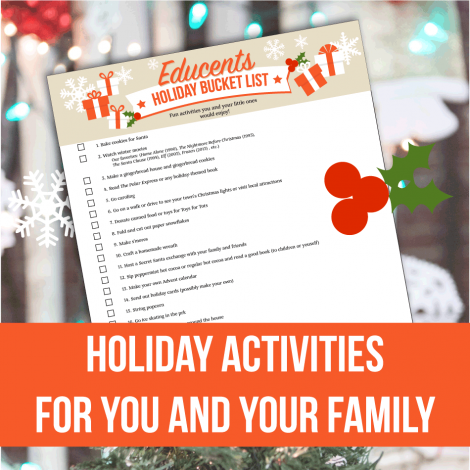 Download this FREE Holiday Bucket List and have some fun with your family trying to get all the items checked off! How do you like to celebrate the holidays? Educents combined a list of 25 activities that will keep the 25 days until Christmas festive and fun! Just download, print, and hang on your fridge. Every time you complete a holiday-themed activity, let your little one cross that item off the Bucket List. Bucket List items include holiday reading, our favorite winter-y treats, and outdoor activities! Once your Bucket List is complete, you’ll know your holidays will be filled with fun and love!